Sen. Tom Cotton (R., Ark.) praised the Justice Department's formal charges against Chinese telecom giant Huawei and its chief financial officer on Monday, saying they gave the U.S. more information about the company's "campaign of theft and economic sabotage against America." Huawei and its CFO, Meng Wanzhou, were charged with crimes that included stealing trade secrets, obstruction of justice, and bank fraud by evading sanctions against Iran, the New York Times reported. 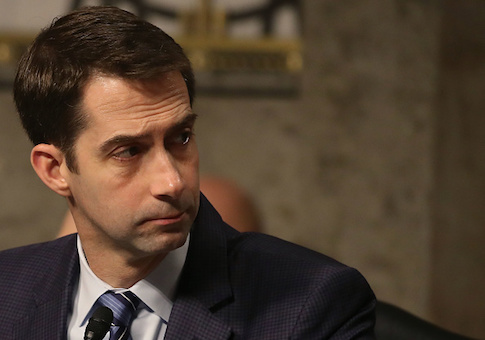 Cotton has played a leading role in the U.S. Senate in calling attention to Huawei's skirting of sanctions and role in Chinese spying. U.S. intelligence agencies have linked Huawei to Chinese military and intelligence services, and the Washington Free Beacon reported the telecom giant has been targeted as part of a wider effort by the Trump administration to press China in trade negotiations and over its technology theft. "Ordinary companies do not help rogue regimes like Iran evade U.S. sanctions, but Huawei is no ordinary company—it is effectively an intelligence-gathering arm for the Chinese Communist Party," Cotton told the Washington Free Beacon in a statement. "Thanks to these indictments, we know more about China's collaboration with Iran, as well as its campaign of theft and economic sabotage against America. Huawei has played a key role in spreading China's spying capabilities around the world." Cotton said Congress should act by passing his bill, the Telecommunications Denial Order Enforcement Act. "My bill would impose the death penalty on Huawei, which is precisely what it deserves for violating our sanctions," Cotton said. Cotton introduced the bill with Democratic Sen. Chris Van Hollen (D., Md.) on Jan. 16, with Reps. Mike Gallagher (R., Wis.) and Ruben Gallego (D., Ariz.) introducing it in the House. Meng was arrested on Dec. 1 in Canada at the request of American prosecutors. Acting Attorney General Matthew Whitaker said Monday that the U.S. would seek her extradition. This entry was posted in National Security and tagged China, Chris Van Hollen, Huawei, Tom Cotton. Bookmark the permalink.